During the early years of a child’s development, parents play the prime role in the formation of the child’s identity, attitudes and beliefs. However, as the child grows, peers take over to influence beliefs towards the outside world, including appearance, lifestyle, education, and even, career. This peer influence and the need for social acceptance is most significant at adolescence, than at any point in our lives. Yet when this influence collides with career choice, it becomes all the more crucial to understand the role it plays in swaying a student’s career beliefs and decisions, and to control it before it leads to undesired results. Let’s take a look at a few cases of students, who we have helped find the right direction in their career. Sahil had opted for science in 11th because he had always done well in studies. Having vague ideas about his career, he decided to go for engineering, because IIT and IIT coaching was the “in thing” and “everyone was doing it”. After spending thousands of rupees on coaching, he ended up in a mediocre college, IIT a forsaken dream. Now, in his second year of B.Tech, with 4 backlogs and a fading will to attend college, he is trying to come to terms with the errors in his thinking, and wonders how his life would have turned out if only someone had been there to guide him back then. Riya had always had a flair for writing and expressing her opinions about the political affairs of the country. When faced with the decision of choosing a stream after 10th, she decided to go for commerce as, “all her friends were in the commerce section, and she did not want to be alone.” She soon realized her mistake when she couldn’t make head or tail of accounts and business studies, and as a consequence failed to perform well academically. With such a blow to her confidence, her desire to write also faded, and now she constantly doubts her self-worth and is unable to find any motivation to study, even with the board examinations fast approaching. Shraddha was like any average student. She performed well in school, liked to hang out with her friends on weekends, and had many different interests. And like most other students, she had never really given a serious thought to her career, choosing to live in the moment. When that fateful moment came, when she could avoid the decision no longer, she decided to listen to her friends who convinced her that Mass Communication is the career to be in. Firmly believing in the thrilling picture her friends had painted, she went on to pursue the course for her under graduation. The pretty picture soon faded away when she started feeling that “something was missing”, and that it is “just not her.” Now, after graduating, she is trying to search for a career well-suited to her. The names of above cases have been changed to maintain confidentiality. 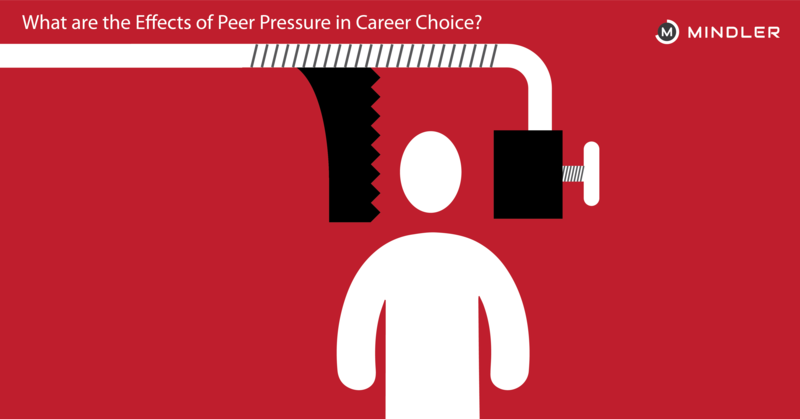 What are the Effects of Peer Pressure in Career Choice? The purpose of the above-mentioned examples was to give you a bigger picture of how even the most minutest of things, such as treading on the popular path, or trying to fit in with the peer group, can have greater consequences when it comes to your career. Students often rely on the misguided assistance of their peers, who hardly have any idea what they are doing themselves, and base their own decisions on limited information and a distorted version of the facts. The most elementary of things is that a student who ends up with a wrong subject choice, based on inputs from peers and others, would find it challenging to cope with the academic requirements of the course. Inability to concentrate, memorize, understand, and perform are just natural outcomes in such a case. As the student gradually loses the motivation to exert effort, s/he is likely to become withdrawn, both academically and socially. The student’s inability to cope with expectations both at home and at school/college is further likely to lead to a loss of self-esteem and confidence. A fear of failure results as the student starts to doubt his/her self-worth and ability to perform well. Lack of self-esteem and confidence are often accompanied by adverse effects such as anxiety, stress, loneliness, interpersonal problems, and even depression. Now, even if the student manages to score enough to finally land up in the particular career field, there are high chances that the shortcomings in the academic life would carry forward in the work life too, as the essential match of aptitude with the career is missing. This lack of aptitude is likely to remain as the individual would find it difficult to bring about a level of competence and excellence expected at the workplace, and end up staying mediocre. In such cases, a feeling of “unfulfillment” and “inadequacy” is quite common. Keeping performance aside, one needs to essentially “enjoy the work” to gather the motivation to work every day, and have a chance at a fulfilling career. Yet, if one’s personality and lifestyle don’t match with the basic requirements of the career, s/he is likely to feel mentally and physically exhausted every day, trying to deal with the daily activities of their job. The best example of this would be an introvert stuck in a job that involves daily meetings, social gatherings and group interactions. Such a person is naturally going to feel worn out by the end of the day, trying to fit in in an environment that lies outside of the comfort zone. 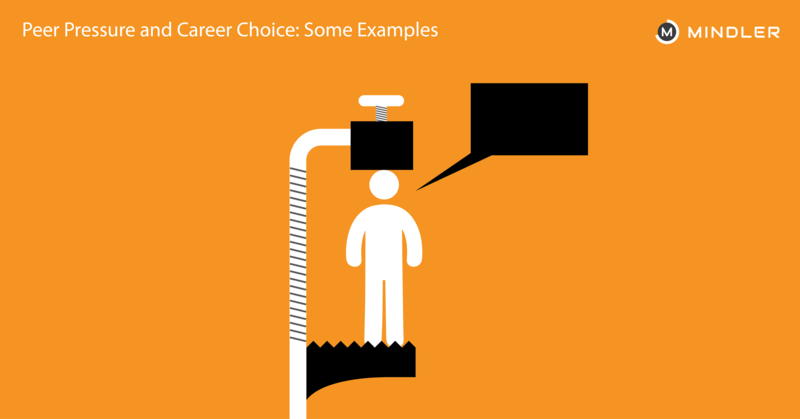 How to Avoid Peer Pressure While Making a Career Choice? The far-reaching effects of basing career decisions on peer influence are clear for you to see. Now, what is it exactly that you can do to curb it in your career? The first step to minimizing any negative influence in your life is to emphasize the positive. Reaffirm your self-worth, and have confidence in your own ability to take the right career decision, without relying on the opinions of others. Avoid trying to “fit in” with others and losing your individuality in the process. Peer influence doesn’t always have to be negative if you take the right approach towards it. The difference lies in not taking everything at face value, and constantly questioning it. Your friends might hold some valuable information that could prove beneficial to you, yet, if you agree to it unquestioningly, then you are in the wrong. Whenever you hear any bit of information/opinion from one of your peers, take the time to think and research on it, corroborate that information with actual facts, and get in touch with mentors, who know about the career, to find the answers to your questions. Divert your attention from the views of others, by directing it towards building constructive skills that would help you with your career in the long run. This can be anything from developing your language skills, to volunteering with NGOs. Set goals for where you wish to be, then figure out the skills you need to get there. Focus on building actionable plans for your career, which would leave you with hardly any time to concern yourself with others’ beliefs and judgments. Best career decisions are made by taking into account the student’s characteristic traits, abilities, and strengths. Rather than relying on other people who can only see a part of the whole picture, make the use of psychometric assessments, that are the most scientific and accurate way to make career choices. Such assessments take into account your personality, aptitude, interest, socio-emotional intelligence and other factors to recommend you careers that are best-suited to you as an individual. Try such an assessment to gain an understanding of your work-style and other traits. It can get overwhelming to do everything on your own, and it is okay to seek help to make THE most important decisions of your life. Yet, it needs to come from the right people. 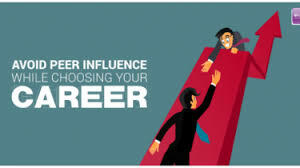 Career counsellors are experts in this domain, and can help you deal with peer influence, by helping you find the right career suited to your own abilities, and by sharing with you accurate information to counter any wrong ideas. The difference between counsellors and your peers is counsellors do not let any personal biases enter into their advice, and they take into account your personality, aptitude and other factors, rather than popular opinion when suggesting you any career. 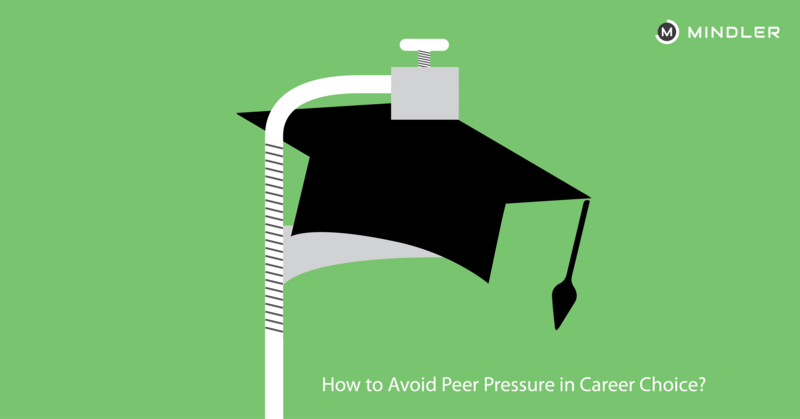 We hope this information would equip you to deal with peer pressure head on, and take the right career decision.